Charlie McDowell, professor of computer science and associate dean for undergraduate affairs in the Jack Baskin School of Engineering at UCSC, said adding new women to the U.S. tech talent pool is one of the goals of the Pacesetters program of the National Center for Women & Information Technology (NCWIT). As part of the NCWIT Pacesetters program, the Baskin School of Engineering is taking a leadership role to promote the meaningful participation of women and girls in computing and information technology. The school's faculty and staff have introduced a number of initiatives to encourage more participation of women in computing at UC Santa Cruz, McDowell said. NCWIT Pacesetters is an accelerated program in which global corporations and academic institutions publicly commit to adding a goal number of "net new" women to their organizations. Increased diversity in the technology workforce has the potential to increase the size and talent of the U.S. workforce, improve innovation, and boost profits. Pacesetters organizations have set concrete goals for diversifying their organizations by implementing deep and accelerated changes: program and policy reforms, refined admissions criteria and curriculum, and improved perceptions about the value of women's technical contributions. 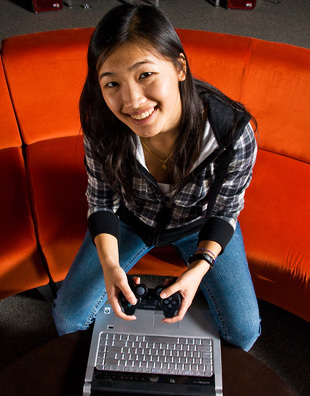 Together, Pacesetters seek to add 1,000 net new women to the U.S. tech talent pool by 2012. The Baskin School of Engineering's plan includes outreach efforts for middle school, high school, and current university students. The engineering school is reaching out to high school women through the Bay Area Affiliate of the NCWIT Aspirations in Computing Award, which encourages young women to continue to pursue their interests in computing and technology and works to gain greater visibility for the role of computing. "There are many young women with the talent and skill to be great technologists, and we are committed to do everything we can to increase their awareness of the exciting opportunities available and encourage their technical interest and success," McDowell said. Additional efforts by the Baskin School of Engineering to attract more young women to computing include a middle school summer camp called "Girls in Engineering," with a focus on computer science and engineering; an outreach "road-show" conducted at local high schools; and an NSF-funded scholarship and engineering learning community for incoming students. The engineering school's approach includes outreach to prospective girls, "in-reach" to current UCSC women, and re-design of entry-level courses in computing, McDowell said. In the classroom, a two-quarter introductory programming course has been established to better accommodate those with no previous programming experience. Also, the "Introduction to Computer Science" course has been revamped. "The course was recently redesigned with an eye towards drawing more women into computer science by helping them appreciate the broad impacts of the discipline and the wide range of intellectual endeavors involved," McDowell said. This fall, the Baskin School of Engineering launched "Project Awesome," targeting first- and second-year female students at UCSC, including a new publication and website at awesome.soe.ucsc.edu. "The growing national need for computer scientists and technologists will not be met without the meaningful participation of women and girls, and the Baskin School of Engineering is committed to inviting more women to shape the future of technology and computing," said Adrienne Harrell, director of undergraduate student affairs for the engineering school.